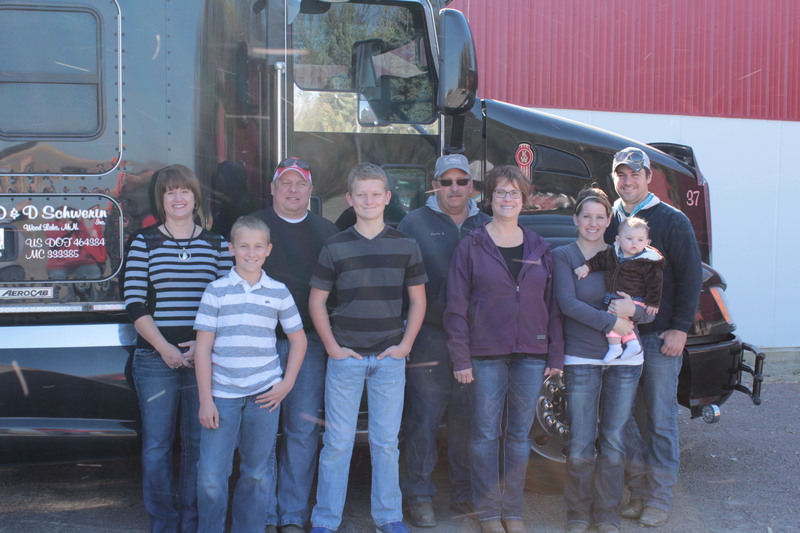 Focusing on sound business practices and management strategies has allowed the Schwerin family of Wood Lake, Minnesota, to build the foundation for a farm that provides opportunities for family members today and for generations to come. Dave Schwerin started farming with his father, Harlan Schwerin, in 1978. They raised corn and soybeans and had a small farrow to finish hog operation. When Harlan Schwerin retired, Dave and his wife Diane, looked for ways to diversify and grow they farm. They added sugar beets to the crop rotation and began increasing the hog production. They also added a trucking company in the early 1990′s. The operation has now grown to finish about 90,000 hogs each year. Dave and Diane have three daughters: Dani, Desiree and Dana. All three daughters helped with farming and hog chores as they grew up, but didn’t initially plan to come back to the family farm. Now, two of the daughters and other family members are part of the farming team. Dani joined the farming business in 2013. Les Sander, a longtime employee, has also bought into the business and serves as a general manager. Dani’s husband Erik Stonestrom runs the trucking business and Dana has recently begun working in the hog production. A nephew, Kevin Schwerin, who grew up in the Twin Cities, and was a deputy sheriff, is also a part of the farm, managing the grain production operations. They have a combination of 20 full and part time employees. The Schwerin family also has a long history with Pipestone Veterinary Services and Pipestone System. The Schwerin farm was about 75 miles away from Pipestone, Minnesota, which Dave said was a huge obstacle at that time to have their veterinarian so far away. However, he was impressed with their approach and began working with them. When the first Pipestone System sow barn was built, Dave was very interested in the concept because it would provide an opportunity to improve genetics in their herd. The Schwerins first bought shares in Calumet, the second Pipestone System barn. They currently are shareholders in the Skyline sow unit in eastern Iowa and Legend unit in northwest Iowa. All the weaned pigs are finished in barns within 20 miles of their home in Wood Lake. He credits the initial vision of Dr. Kennedy and Dr. Spronk to keep producers at the leading edge of industry practices with the success. Also when the first gilt multplier units were built, Dr. Kennedy personally guaranteed the units with the banks which was unbelievable trust in the unit’s shareholders when the concept was new to the industry. The majority of finished pigs are processed at Triumph Foods in St. Joseph, Missouri. Dave is one of 30 farmers who are part of Allied Producers, a co-op that is a shareholder in the Triumph Foods Company. “My goal has always been to control the destiny of the pigs I raise from birth to the grocery store. We’re not at the grocery store yet, but we are involved at the processing level,” he said. For Dani Schwerin, it wasn’t a direct path back to the farm. She learned about an opening for a health and biosecurity technician with the Pipestone System, applied and began the job in 2008. She worked with Dr. Joel Nerem to ensure biosecurity at the sow farms, conducting site visits, developing protocols and coordinating PRRS research. She also worked with veterinarians at the Pipestone Vet Services to do necropsies to aid in health diagnosis and treatment to improve management practices. Dani had been talking to her parents about returning to the family farm, for several years, which fit into Dave and Diane’s focused approach to transition planning. They worked with a business consultant to create a management structure for the business. “The real motivation for Diane and I was to set up a structure for a business that will thrive for generations to follow,” he said. They are thrilled to have their daughters and families living close to home, and have several family members working at the farm, however he notes that it can sometimes be a challenge.